The Lions are back and have their sights set on bringing a championship home. With a high powered offense and an up and coming defense, Detroit is ready to regain the NFC North division championship. Division rivals, the Green Bay Packers and the Chicago Bears will look to stand in the Lions way. Grab your Detroit Lions tickets and head over to Ford Field to be a part of your favorite team's quest for a championship. The Lions did not qualify for the playoffs for the 2017 season. They finished the regular season 9-7, finishing seventh in the NFC. But they have high hopes this season with fresh picks such as LB Jarrad Davis and QB Brad Kaaya. With the latest NFL season approaching, Detroit has all the ingredients for an impeccable season. Thanksgiving Game, 1962 – Detroit’s immediate rivals, the Green Bay Packers were undefeated heading into the 1962 Thanksgiving Game. That is, until they met the Lions. Detroit won the game 26 to 14, leaving the football world pleasantly surprised by these underdogs. Sanders out runs Smith – As one of the most loved players by Detroit fans, Barry Sanders is arguably the champion of the people. Sanders particularly entered the limelight after beating Emmitt Smith’s on-team record of 143 yards. Sanders ran a staggering 194 yards during a 1994 game in Dallas, impressing spectators and team mates alike. 2013: Reggie Bush embarrasses the Chicago Bears – Bush became the key ingredient to Detroit’s defense during the 2013 NFL season. In a week 4 face-off with the Bears, Bush made a memorable run past multiple defenders from Chicago all the way to the end zone. This effort just before the second half was crucial for Detroit to win the game 30-10. The Minnesota Vikings – Historically the Minnesota Vikings have an upper hand in this rivalry with 71 wins out of a total 108 games between the two teams. However, in recent years, the Lions are catching up. 2010 onwards, the Lions and the Vikings have won six games each. It would be safe to say that the Lions are right on the tail of the Vikings. The Green Bay Packers – The Packers are not too far behind the Lions in this face off. The two teams have a classic fan rivalry. Both teams play in the NFC North Division and are right behind each other with the Packers finishing first, and the Lions finishing second in the NFC North 2016 season. Let’s see who comes out on top in the 2017 NFL season. At present, the most popular player has got to be the Honolulu-hailing Ndamukong Suh, who is a favorite amongst fans. Detroit has championed talented athletes over the years such as Cory Shlesinger and Doak Walker. Schlesinger, also nicknamed Anvil Head is considered one of the greatest of the Lions to have stepped onto the field. Walker, on the other hand, stands out literally because there is a collegiate award named after him. He was an instant success, being named NFL’s Rookie of the Year in 1950. Sure enough, his Hall of Fame induction came in 1986. Ford Field presents Lions fans with a first class viewing experience. The Stadium incorporates the old Hudson’s warehouse (established in the 1920’s) as part of the industry-leading sports and entertainment development that will include banquet facilities, restaurants, office space, retail services, food courts, lounge areas and all private suites. Ford Field claims the best sight lines of any football stadium in the United States, made available by omitting the traditional club and suite levels and thereby lowering the upper level. Detroit Lions tickets 2018-and their season schedule are both out, so get your tickets before they run out. Our process for purchasing cheap Detroit Lions tickets is simple and fast. There are so many online ticketing sites, that it can be hard for customers to find the right place to buy Detroit Lions tickets at the cheapest price. At ScoreBig we think of our customers first and foremost. We offer daily deals for Detroit Lions events, so our customers can get the best seats for the best prices. ScoreBig will always go above and beyond to offer the cheapest Detroit Lions tickets on the market. The Detroit Lions schedule above, displays all available events for 2019 and 2020. Once you find the event that you would like to go to, click the red “Get Tickets” button. It is located on the right-hand side of the event listing, it will take you to an Detroit Lions event ticket page. ScoreBig's event ticket page will display all available Detroit Lions tickets for that event. On the event ticket page to help with your search for the right Detroit Lions tickets, use the filters at the top to select quantity, price range, and more. There is also an interactive seating chart so you can pick where you want to sit. When you are ready to buy a ticket, click on the listing, and you will be directed to ScoreBig's checkout page. Upon completion of the information fields, your order will be processed and your Detroit Lions tickets will be delivered via email, mail, or to your mobile device. What makes ScoreBig’s site stand out from the rest? We are constantly analyzing our competitors to improve our site, service, and prices. ScoreBig.com employees strive to offer the best process and experience to buy cheap Detroit Lions tickets. Our goal is to get you the best seats to Detroit Lions events. We offer daily discounts on our site and for special promotions check out our newsletter. If there are no Detroit Lions events currently available, you can use our search feature at the top of the page to see a list of all popular events going on near you. No matter your price point, we have all the best deals and discounts on Detroit Lions tickets. For more information on prices of Detroit Lions tickets and the schedule for Detroit Lions, check out our listings above. The last thing you want to find out is when the Detroit Lions event you wanted to go to is sold-out. Don’t worry in many cases ScoreBig has affordable tickets to sold out events. We sell tickets from GA all the way to premium seating and parking. Skip the scalpers in the parking lot and get your tickets online from top Detroit Lions ticket brokers. We get you in all events, buy your Detroit Lions tickets here from a brand that many trust and rely on for all their ticketing needs. ScoreBig offers a 100% money-back guarantee. If you have been in search of cheap tickets for Detroit Lions, ScoreBig by far is the best option. That’s why ScoreBig has more loyal customers than any other ticketing site. 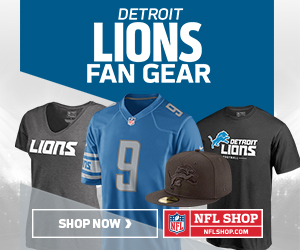 Shop at ScoreBig for safe and secure Detroit Lions event tickets.